Studying in Ghana with ThisWorldMusic was one of the best decisions I've ever made. This trip was life changing, to say the least. So much hard work goes into putting these trips together, and it shows. The week I spent at Dagbe was amazing, and taught me so much more than I could have imagined. I had done Ewe drumming before the trip, but after going to Ghana and studying with the master drummers at Dagbe, I've found a new passion. All of the staff at Dagbe are great. I've only been home for a few weeks, but I'm already planning my return trip to Dagbe! Akpe, Jeremy and the Dagbe staff, for an amazing experience! While at Dagbe, the classes and lessons are intense and rigorous, and I never felt as if I wasn't learning something. I took over four hours of drum classes/lessons a day, and always felt like I was being challenged to push myself and learn more. Jeremy and the Dagbe staff were very accommodating and helped me do and learn exactly what I wanted to. Every day of the trip was educational in its own way. 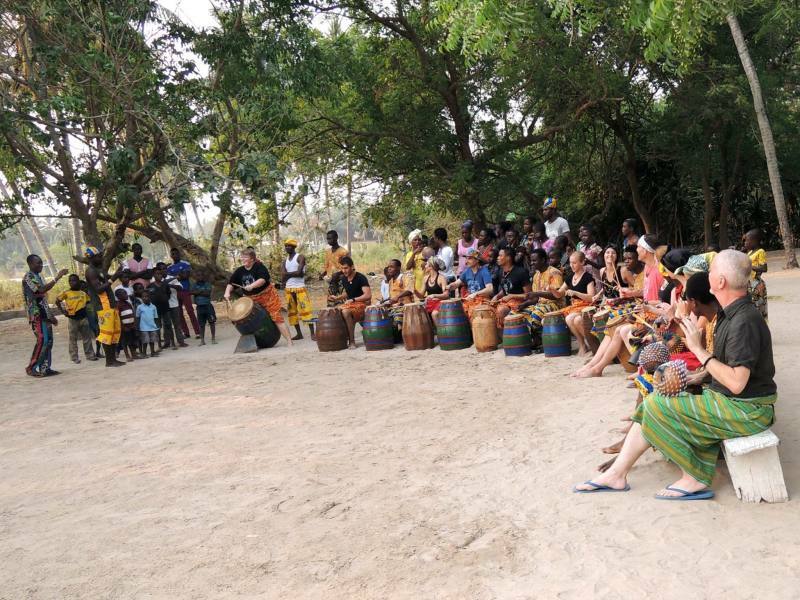 From visiting a drum maker's workshop, to drumming and dancing with the Ghana National Dance Ensemble, to attending a traditional Borborbor festival, every day was a new, educational experience, and I always felt as if I was learning. I thought the living arrangements were great! Living at Dagbe is similar to living in a college dorm. The rainwater system that they made is awesome, and it's just like having running water (good showers, flush toilets, etc). All of the rooms at Dagbe have ceiling fans and mosquito nets over the beds, and both are very useful. I'm still thinking about the black eyed peas and fresh pineapple!!! The food at Dagbe is traditional Ghanaian food, and it's really good. There's usually rice, plantains, or a local starch, along with black eyed peas, cabbage stew, some kind of meat, etc. There's also always fresh fruit, which is amazing. The pineapple in Ghana is the best I've ever had. At the Afia, you can choose between traditional Ghanaian food as well as some American options. In Kopeyia, I felt pretty integrated with the local culture, but I wish that we could have learned how to speak some more Ewe so that we could be even more integrated. I spent about $60 on food and water while in Accra. Food and water are covered at Dagbe, so there are no expenses other than private lessons and souvenirs, etc. Not including program expenses, about how much money did you spend on food and other expenses each week? I spent $350 over the course of the entire trip. Most of that went to private lessons, clothes from the tailors (Gabriel is awesome! ), and souvenirs. Do you have any general money-saving tips for future study abroad participants? Change less money than you think you'll need, because you can always change more. * What do you know now that you wish you knew before going on this program? That I didn't need to worry because it would be an amazing experience.